In reflecting on this month, I say it has probably been my busiest all school year. Between midterms, spring break, keeping up with classes, and school activities it seems as if this was the time on the calendar that everything happened to take place. I can confidently declare everyone hates midterms and for me, preparing for them is always worse than the actual test. So, when professors started handing out study guides I knew it was time to crack down and get serious…it was time again for Neil Hellman to be one of my closest friends, and Neil and I have a love/hate relationship. After all was said and done I could not complain about my grades, but that was only the beginning of the list of things that had to be done. 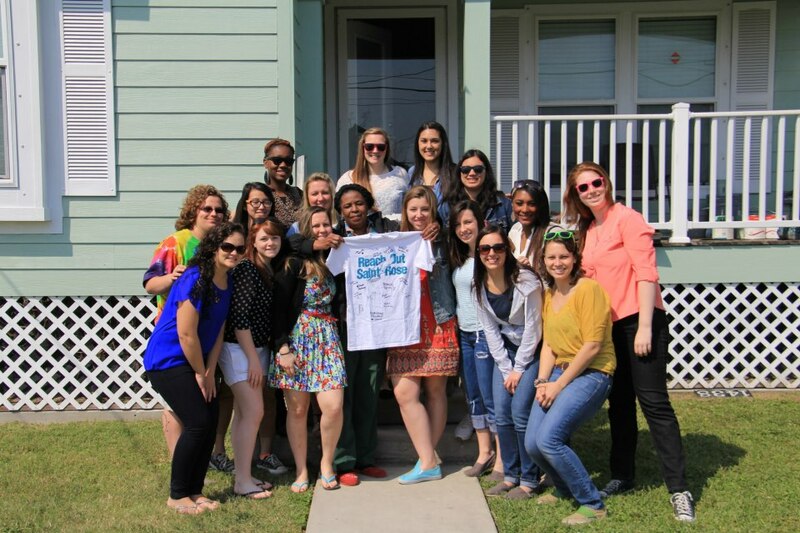 For spring break I was granted the opportunity to go to New Orleans, LA and volunteer on an alternative break. Being that I had wanted to attend this trip since my freshman year, I leaped at the favorable circumstance! In addition to accepting this, meetings were to be attended every Monday and fund-raising had to be done. With a pre-written letter and help from my parents who provided lists of people to send copies of the letter to, raising money was not a very hard milestone and really paid off, no pun intended. The meetings were never an inconvenience, I even started to look forward to them as I became closer with the other girls going. After charity had been given, I could finally look forward to packing and imagining how this trip would turn out, all I could do was hope for the best. By the second day of being in New Orleans, my expectations were far exceeded. The group was more like family and I was in awe with the work effort every single one of us had given toward those we were trying to help. Without the intent to sound corny, the trip was truly life changing. I returned to New York with great appreciation for everything I have been blessed with and a couple of battle wounds from the labor, but nothing I would change at all. I could talk about that trip for days so I’ll stop there, I think you guys get the idea.. IT WAS EXTRAORDINARY. 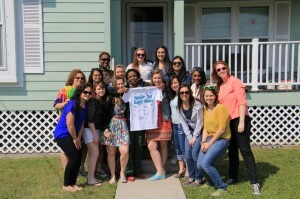 This is the NOLA crew honoring a fellow New Orleanian with a Saint Rose t-shirt we all signed. This past weekend I attended a school trip to Baltimore, Maryland. This overnight gave us the chance to hang out down by the beautiful harbor and see the nationally touring play Peter Pan. An added bonus was getting to spend time with my aunt who happens to live in Baltimore. She even treated my friend and I to dinner on the harbor! I love the trips provided by Student Events Board because it’s nice to get away and have a mini vacation once in a while for a little bit of money…if you won’t have homework overload by the time you get back. As my March Madness comes to an end, all I can do is reflect on the insanity and acknowledge that I have been nothing less than blessed. All of the hard work put into these past weeks have been more than rewarding. So many new friendships were made, I was able to see a little bit more of the world and my grades didn’t suffer in result to the craziness (that’s always a plus). I’m ending this month in the right way, spending time at home for Easter with my lovely family. Now all there is to do is hope the weather turns around in New York and we finally have SPRING! Happy Easter to those who celebrate it! !